Last Sunday afternoon, I hiked up towards Ellis Peak over Lake Tahoe. It’s a gorgeous, 2,500 ft incline from lakeshore to the top, journey that, at times, makes one question why they set out on it in the first place. And then you come to the view at the top over looking all of Tahoe and the whole circumference around it and, you know why. It’s so silencing. What Mama Earth is capable of is stunningly, rivetingly breathtaking — to say the least. 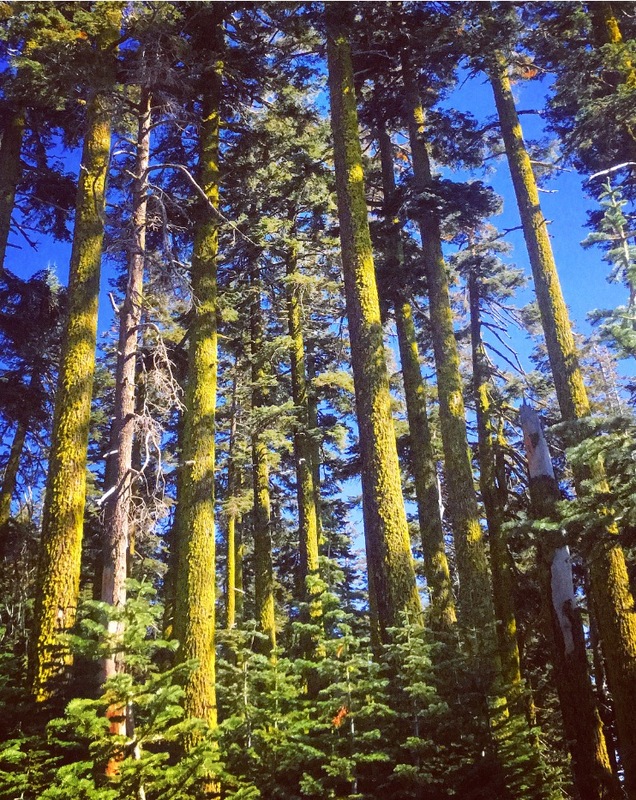 I was so deeply touched by the radiant, dancing beauty of it all, the glowing green colors blanketing all these trunks, as if they were getting ready for another harsh winter, choosing to put on some extra mossy, extra vibrant, green coats. I felt these tall beauties alive, chattering with each other, and happily living fully, there along this trail I was on. All the while, crowding all around them on that beautiful mountainside were hundreds, thousands of these new little trees, clamoring almost, to be right there with the wise-ones. Most of them not more than chest-high on me, it blew my mind how there could be such a mass of them in such a “small” space. Again, I felt such delight at seeing them, so early in their journey, and took time to talk with them, touch them, bless and welcome them, applauding their appearance at this time on the planet. They are needed! It was breathtaking to see this swath of wise-old and regeneration happening together so powerfully. …And then the very next morning I woke to learn of the (still ongoing, as of this posting) fires in Northern California — where I was planning on driving down to that day; where many siblings, relatives and friends live. I’ve spent the days since witnessing the devastation of the ravages that unhindered fire can create, and continues to. The absoluteness of it is staggeringly, stunningly, humblingly…breathtaking. What I know is this: the spectrum of what’s possible here on this planet is all this and everything in between: spectacularly and simply, terrifyingly and excitingly, grossly and subtly…breathtaking. And we, us little humans — we are here for the ride of a lifetime. We are here for the joy of experiencing the beauty and the horrors of it, and all the gradations between. We are here to be there for each other always — and not just in times of tragedy, but always, compassionate and kind — and to be worthy stewards and thoughtful guests of this planet for the short while we’re here. But when we forget to notice — when we turn away from engaging with what is happening, with each other, choosing segregation and self-aggregation of what we’re already familiar and comfortable with instead; when we’ve chosen, in our arrogance, to believe we are in charge of this all and can control it, we are no longer understanding why we are here. We’ve forgotten to allow our breath to be taken away continuously by the incredible outrageous outrageousness of it all. How often do you look up and see the trees, let alone greet them, or talk to the flowers, rocks and grasses? How often do you check out the remnants of an rotted shellfish carcass or a dead flower and see it's beauty too? How often do you look at a total stranger and soften in the sheer beauty of another breathing human standing next to you — even if they have grossly different beliefs than you? How often do you build a bridge rather than a wall? How often do you really play with an animal, or nap in a sun puddle, or cry from delight over a new taste someone prepared for you? How often do you take time to cry inside and out at a glorious sunset or sunrise? How often and for how long do you actually unplug from the tweets, the updates, the massive swath of media pouring out like a tsunami bound to drown you in their fear, anxiety and us vs. them mentalities and choose, instead, to feel your feet, naked and free, on the ground, and look up at the sky and experience your connection to it all? How often do you simply stop and feel the simple and holy movement of a continuous breath in your body — the rhythm that's keeping you alive? This life is a gift. We need to love remembering this every day. May we not need to be reminded with more drama and tragedies, but rather wake up each day and remind ourselves of it when we take our first conscious breath of a new day, again. This life is a gift. A breathtaking, awesome, outrageous gift.